This afternoon I had a chance to catch up with RL Architects member Rakeem Buaku, an avatar representing Dedato, an architecture studio from Amsterdam. 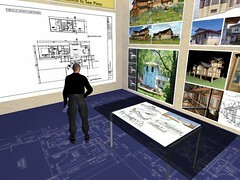 Rakeem is building a model of his studio’s new headquarters inside of Second Life, and plans to use the virtual model as a tool for promoting and presenting the real life project. Currently, the project consists of a large skeletal concrete frame, as well as a hint of the fenestration chassis that will envelope at least part of the structure. Site entourage, such as roadways, waterfront and landscaping are also starting to take shape. The Second Life site is nearly identical to the real life site, which is an essential ingredient in telling this building’s story, since it is perched on a piece of waterfront property; the views of which played an obvious role in developing the massing and orientation of the project. While his build already shares status with aloft’s hotel as being among the most significant projects stemming from RL architectural practice, Rakeem has even bigger plans for Second Life. His methodology extends beyond merely replicating his studio’s real-world designs. He suggests that the typical RL to SL trajectory could stand to be reversed. By designing projects in Second Life and translating those models into real-world designs, he takes advantage of the simplicity of the in-world tools and could enable clients to have a more participatory role in the schematic design process. As we toured his soon-to-be new office building, we wondered why more architects aren’t using Second Life as a professional tool. Perhaps most architects are too conservative? Perhaps there are too many challenges? Too much to learn? Perhaps some struggle with spending so much time playing a game? While each of these points may have validity, I think any architect exploring Second Life would agree that the potential is there, and that it will only be a matter of time before this kind of environment becomes commonplace in our practice. Rakeem Buaku isn’t going to wait for a perfect platform. In the meantime, his studio’s clients will enjoy an unprecedented level of immersion and visualization, and his firm will likely enjoy the marketability and publicity the cutting edge affords. Stay tuned for progress posts! Today at 4:00 PM SL-Time, the Society for Virtual Architecture will be hosting a presentation by Jessica Quin, IBM’s Second Life Architect. Landmark HERE. This series of 3 volumes called ‘second life architecture’ is impressive! The machinimatography (especially in Volume 1) conjures quite a compelling and fluid perspective that isn’t easily percieved first-hand when inside of Second Life. I sincerely hope they continue the series. Now all I need is an interpreter! Posted more screenshots from last night’s meeting HERE. I missed snaps of a few of the tours while trying to keep up with the chat stream. If anyone has ones I’m missing, please email them to me at jbrouchoud(at)sbcglobal.net Thanks! The Second Life Foundations meeting last night in Tinta Verde turned out to be a truly enlightening discussion. Seasoned builders and architects shared some of the latest building tips and techniques with each other, and with those who were just starting out. We also discussed what our collective suggestion to Linden Lab might be, in terms of new building tools we would like to see developed. Our unanimous agreement seemed to be that we want the existing building tools fixed before any new tools are introduced. Lots of other suggestions were brought to light as well, such as the ability to group multiple linked objects, limits on prim size and much more. The discussion also featured a great deal of positive feedback, as well as an overall enthusiasm for what Second Life has to offer. Several architects and builders rez’d their projects throughout the island, and we had time for guided tours of a few of them as well. This meeting was indeed a ‘Foundation’. Chip Poutine has offered to begin a Wiki resource for building tools and techniques, and we will be making a group to include everyone who attended last night or wants to be a part of this ongoing discussion. We will be inviting everyone who attended last night, but if you were not there and want to join, please IM me (Keystone Bouchard) and I’ll will be sure to send you an invite. We will also be holding future topic-based meetings as well, so stay tuned! Zarf Woodward (Brian Mathews) and Collaboration Source (Jonathan Knowles) podcast from Autodesk Island in Second Life. 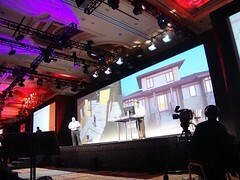 I just returned from Las Vegas, after having the honor of closing Autodesk CEO Carl Bass’ keynote presentation with a Second Life tour of our Crescendo Design Virtual Studio in front of 6,500+ attendees. 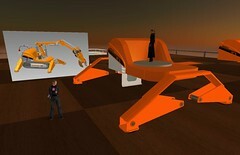 The presentation concluded with 2 separate live feeds from Second Life, whereby Mr. Bass’ avatar joined joined Jon’s avatar, Keystone Bouchard for a tour of the studio. I have also had the unique privilege to be working for Clear Ink as they develop Autodesk’s Second Life presence in preparation for this demonstration. During the past few weeks, I have been working with a team of incredibly talented people to determine what this project should consist of. 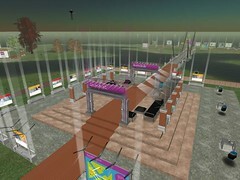 Our goal was to create a space that would highlight the community, social and collaborative features of Second Life, as well as to encourage visitors to begin exploring the world for themselves. 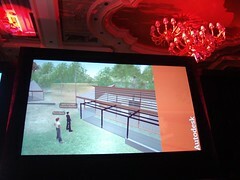 As a result, the architecture of Autodesk Island became more of a backdrop or space instead of a strong central icon. 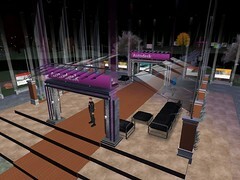 The main greeting area is not a heroic corporate building, but is instead an open air forum; designed to foster and encourage interaction between avatars. The forum is surrounded by kiosks that provide tools, tips and tricks to help get people started, as well as a diverse list of landmarks to both mainland and island destinations. Aloha Avatars, a service designed to help newbie avatars make a comfortable transition into SL, led by TROI TimTam, kept us on task with retaining the ‘Second Life Spirit’ throughout the island. A strong connection with landscape elements, the water, and lots of other features help create a familiar and comfortable atmosphere. As Autodesk’s program elements began settling into the island’s landscape, the relaxed and inviting sense of place remained. One of the concepts we explored (interpreted, designed and built by Scope Cleaver), was to express both a grounded, representational component of block steel and glass, juxtaposed against a light, airy, flowing virtual element we called the aurora spires. The idea was to provide a comfortable and familiar point of departure, which embraces an element clearly defiant of real world physics; indicative of the limitless potential of a virtual environment. However abstract and steep in theory the end result may be, it was my hope that it would read as an invitation for an eventual transition into a new language of virtual architecture – liberated from exclusively representational iconography. As Chip Poutine reported in 3pointD, Clear Ink’s Kiwini Oe was able to develop a DWF import tool that allows 2D CAD drawings to be dynamically updated through Autodesk’s Freewheel, directly in Second Life. Also on display is Adrian Herbez’s Maya import tool, which allows models to be built using a prim-based plug-in for Maya, and imported into Second Life. 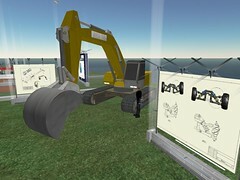 These features of Autodesk’s demo area represent a taste of things to come, as we continue to develop ways to make Second Life a more fluid and automatic tool for professional use. The island is currently only open to Autodesk University attendees, but we expect to open the island to the public sometime after the conference.